My favorite seller was at the Petaluma Farmer’s Market the other week, Chris the peach guy. Chemical-free, great prices, and amazing flavor. He had a “rejects” box he was selling at $1/lb (half the usual price)–mostly ones with small blemishes that most people wouldn’t even notice. I was picking through it when he said, oh just take the whole box for $5. So I did. Probably about 10 lbs worth. As you can imagine, a few of these beauties made it to the compost pile. Not because they were bad when I bought them but because there is only so much you can do with that many peaches. 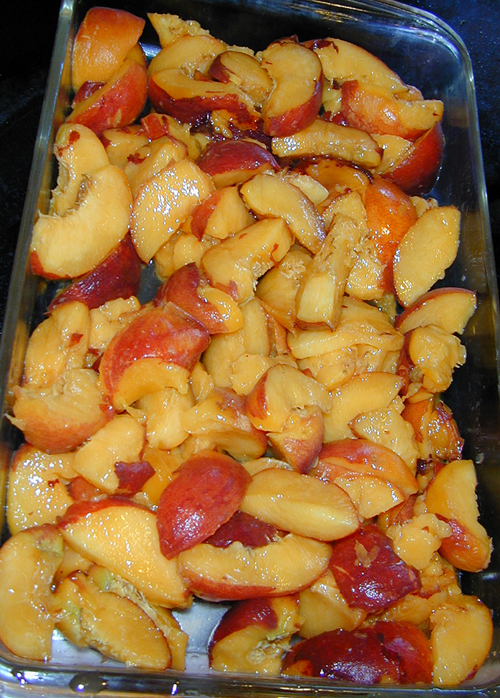 I already have several jars of peach chutney and several bags of frozen peach ice cream mix from previous summers. 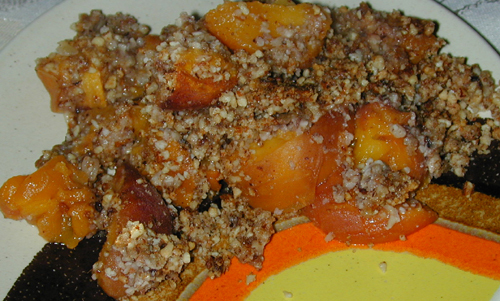 I made quite a few dried peaches, ate a mountain of them fresh, and discovered a new treat: peach cobbler. I didn’t follow a recipe, which is probably just as well since I’ve never made it the “regular” way before. I just put together things that seemed right. I’ve made it twice now. Start by washing and slicing the fresh peaches. I never peel them. The ones below were on their last legs and had been in the fridge for a while, but they were still amazing. You can not make this recipe with supermarket peaches grown for size and shipping stamina and picked too soon. Toss the slices into a lightly greased baking pan. Aim for one layer thick with some overlap. I don’t have an exact recipe. I used nut meal, palm shortening, a little salt, and a touch of honey. My first batch was with ground walnuts and it was great. For the second batch I used ground almonds. It was good but not as tasty. I wanted to use some oats but didn’t have any. It’s best with meal that is closer to flour (or actual nut flour with some meal mixed in). Because I am trying to keep the carbs low, I used nut meal/flour instead of grain flour. In my second batch I added a bit of stevia to boost the sweetening without adding more honey. This worked out well. 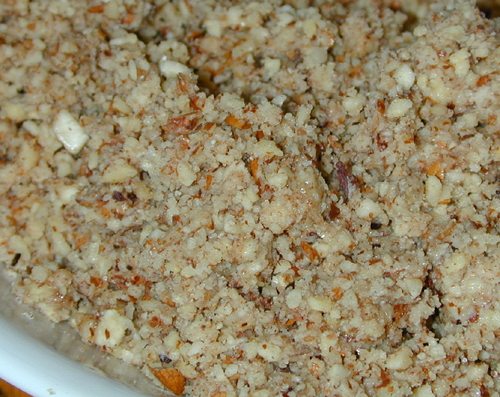 Mix the nuts and shortening first until you have something that can stick together. Then add sweetener and seasoning as desired. Now, put the topping over the fruit and very lightly tap it down. Bake at 400*F for about half an hour, or until done. The first time I made a small batch and just put it all into the convection toaster oven. It came out amazing. The peaches tasted fresh and juicy but there wasn’t excess liquid. The second time the pan wouldn’t fit in the toaster oven so I used the regular oven. I had to overcook it to get the water to evaporate (I cooked the peaches some without topping at first). It was still delicious but the peaches had almost a canned flavor to them. So if you have a convection oven, use it. 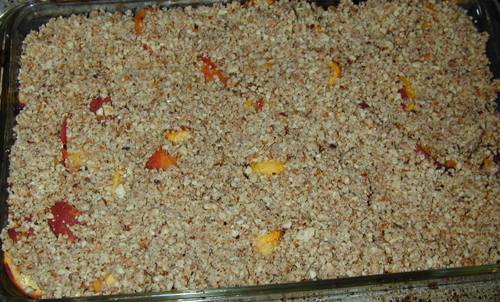 If not, maybe baking the peaches at very low heat at first will work, then add the topping.